Sorry, this unit has been discontinued and is no longer available for purchase, replace by Firebox T10, T10-W, T30, T30-W. You can also purchase available renewals below. End of Life for the XTM 25 Wireless is 01 Jul 2021 - you will not be able receive support after this date even with a 1 Year contract. Small businesses need big security, too, and the newest WatchGuard® XTM 2 Series firewall/VPN appliances deliver that strong protection - but without the hefty price tag. Enterprise-grade security includes full HTTPS content inspection, VoIP support, and optional security subscriptions like Application Control and Intrusion Prevention Service. The XTM 25 and XTM 26 also provide the fastest throughput of any 2 Series models to date. Wireless models feature dual-band 802.11n for Wi-Fi with enhanced speed and responsiveness. Flexible, centralized management tools allow administrators to work from an intuitive console, scriptable CLI, and web UI. Any XTM 2 Series appliance, from the XTM 21 to the XTM 26, makes an ideal stand-alone security solution or VPN endpoint on a WatchGuard XTM network. Everyone loves wireless. With dual-band 802.11n the 2 Series delivers reliable wireless connectivity while allowing you to provide controlled Internet access to guest users without compromising security. Have flexible remote access options, including IPSec, SSL, and support for iOS devices such as iPhone, iPad, and iPod touch. Monitoring and reporting tools, included at no extra cost, support compliance, with drill-down functions that make it easy to pinpoint specific activities. The DLP subscription prevents data breaches by scanning text and common file types in email, web, and FTP traffic to detect sensitive information attempting to exit the network. A built-in library of over 200 rules allows IT to quickly create and update corporate DLP policies. Application Control has become an essential component of next-generation security. It protects the network and keeps users on the tasks that matter by blocking unproductive and inappropriate apps. Gain control over 2,000 web and business applications, using more than 2,500 unique signatures. Have complete visibility into applications used, with intuitive monitoring and reporting capabilities. Control usage of applications by category, application, or application sub-functions. By adding an IPS subscription, your network gains in-line protection from attacks, including buffer overflows, SQL injections, and cross-site scripting attacks. All ports and protocols are scanned to block network, application, and protocol-based attacks. Blocked sites list saves valuable processing time by dynamically blocking IP addresses that have been positively identified as the source of an attack. URL database is hosted in the cloud to simplify setup and administration. A local install option is also available. Scans traffic on all major protocols to stop threats before they can gain access to your servers and execute their dangerous payloads. Heuristic analysis identifies viruses and dangerous code that signatures can’t catch. WatchGuard XTM is the only unified threat management system on the market that includes a powerful, cloud-based reputation lookup service to ensure faster, safer web surfing. Continuous updates keep current with dynamic web content and changing web conditions. Block spam regardless of the language, format, or content of the message - even image-based spam that other anti-spam products often miss. RPD identifies and blocks viral payloads for an additional layer of real-time anti-virus protection. WatchGuard’s UTM (unified threat management) platform is designed to allow network traffic to pass through a full suite of UTM services- from anti-spam protection to Data Loss Prevention-at top performance levels. 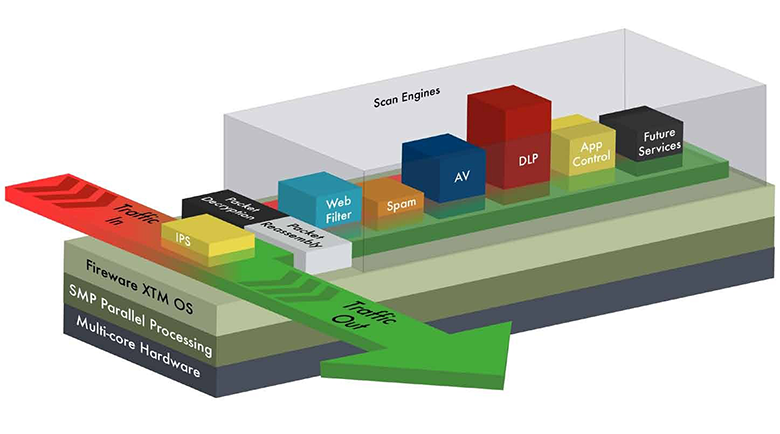 Leveraging the power of multi-core processing, the platform runs all scanning engines simultaneously for maximum protection and blazing fast throughput. Resources are allocated based on the flow of data and the security services that data requires. For example, if web filtering needs more horsepower, additional processors are automatically applied so web traffic keeps moving and your business stays secure. All security functionality on your WatchGuard XTM solution, including UTM subscriptions, can be managed from a single intuitive console. Any security activity identified by a service is logged and stored for easy reporting so you can take immediate preventive or corrective action. All management tools, including rich reporting and monitoring, are included with your WatchGuard XTM purchase. There is no additional hardware or software to buy. Ideal For Remote offices, small businesses that need an affordable solution that easily upgrades to accommodate growth. Available in wired and wireless models. Remote offices, small business, wireless hotspots that want an affordable, all-in-one security solution. Available in wired and wireless models. Optional Centralized (Multibox) Management. Optional licenses enable Drag and Drop VPN and one-touch appliance updates. WatchGuard System Manager Device Upgrade license required. WatchGuard System Manager Device Upgrade license required. Intrusion Prevention Service works hand-in-hand with your WatchGuard firewall's application layer content inspection to provide real-time protection from threats, including SQL injections, cross-site scripting, and buffer overflows. 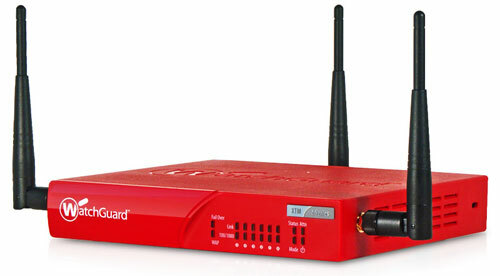 Download the WatchGuard XTM 2 Series Datasheet (PDF). Download the WatchGuard XTM Subscriptions Datasheet (PDF).